The performer showcases his talent on the American stage. 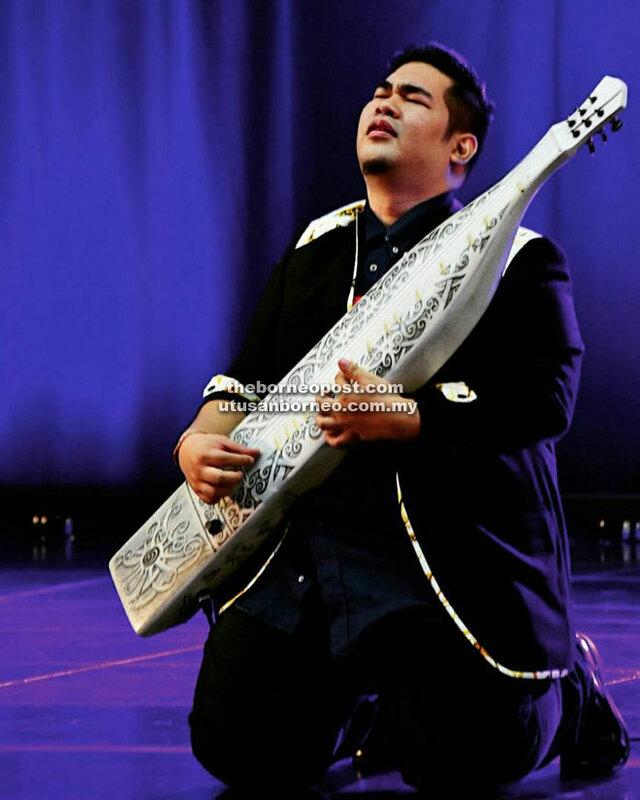 MIRI: Saufi Aiman has set a new benchmark at the World Championships of Performing Arts (WCOPA). The 27-year-old performer clinched the gold medals in the Open, Classical, Jazz and Contemporary Instrumentalist categories, and one silver medal for the Original Works category, at the grand show held in Long Beach, California in the USA recently. Saufi – who has Malay, Melanau and Chinese ancestry – also brought home three ‘Champion of the World’ plaques for the Instrumentalist (Solo) category. “I feel great because it has been a while since ‘sape’ (traditional stringed instrument of the Orang Ulu) was played here in the US,” he told The Borneo Post yesterday. In 2009, ‘sape’ was introduced in WCOPA by Jerry Kamit who in that year, bagged four gold medals and two ‘Champion of the World’ plaques. “This time, I got to set a new benchmark – four gold medals, one silver and three ‘Champion of the World’ plaques. I’m really proud to have been able to surpass that standard,” Saufi enthused. With this achievement, Saufi said he would want to inspire more traditional musicians and instrumentalists to have a go at it. “Traditional musical instruments can and will win the hearts of people from all over the world. It is a real pleasure for me to bring our own Sarawak musical instruments to a higher level,” said Saufi, adding that this year’s WCOPA was his second attempt. He competed in 2012, but did not make it to the qualifying round. 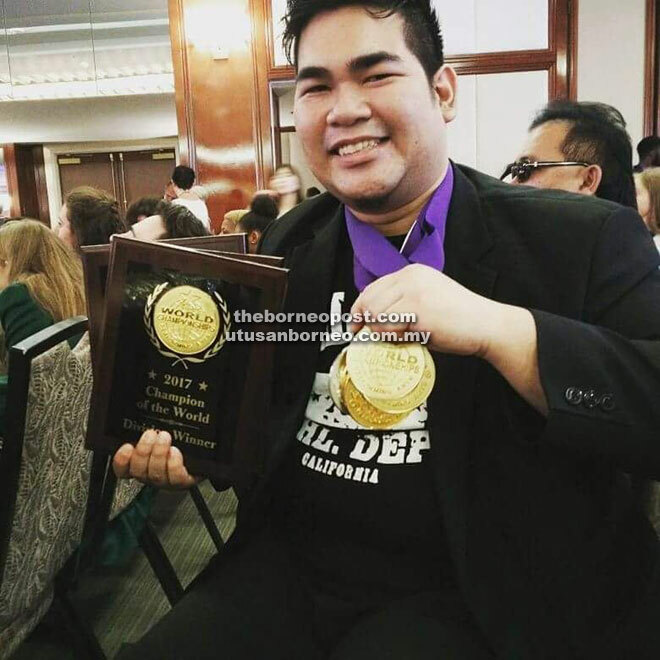 The Universiti Malaysia Sarawak (Unimas) graduate, who is the only child of RTM Sarawak television producer Yahya Sulaiman, left for the US on June 29 with four other Malaysians – Aloysius Susek, Dayang Izyan Zawanie and Esther Applunius who competed in the ‘Vocals’ category, and Nelson Thien in the ‘Dance’ category. They competed against amateur and professional entertainers from 52 countries during presentations which were assessed by 75 judges, comprising prominent figures from global entertainment industry. Back to Jerry, Saufi saw the seasoned sape player as his inspiration to join WCOPA. “He (Jerry) is deemed as the father of contemporary sape music, and to have the sape recognised by musicians from 60 countries is a huge milestone for us,” he said. Saufi is also an entrepreneur – he is the managing director of a sape gallery, ‘Sape’star Enterprise’. Looking ahead, he hoped that there would be more initiatives to showcase traditional musical instruments in Malaysia to the world. Saufi said he also aspired to run more projects and collaborations aimed at expanding the potential of sape music, both locally and internationally. Saufi also believed in the need for continuous efforts in uplifting the local music industry to make it known to the world. “It is hoped that there would be more people coming to support the local music industry, as well as create more platforms for us musicians to showcase our music and perhaps, to compete in prestigious events. “I hope with my WCOPA achievement, the people would now open their eyes. I also hope to create more platforms for future traditional musicians,” he added. WCOPA, which was founded in 1977, is dubbed as the ‘Olympics’ for aspiring artistes, performers and entertainers from around the world.